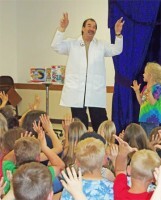 Professor Marvel wowed a highly engaged audience of 103 kids and 34 parents in Howard Lake on Wednesday, June 11. The Howard Lake Friends of the Library hosted the Summer Reading Program Kick-off party, which generated record attendance. They continued to stoke enthusiasm by serving pizza and Kool-Aid. Professor Marvel is one of the many faces of Robert Halbrook, who has been providing library and school programs for 15 years. In addition to demonstrating magic or science or history facts, he provides enthusiastic support for reading and education. Multiple display and activity tables featured a variety of table-top science experiments and projects, such as making "snow" and building designs with magnets and iron filings. Thankfully, a number of parents pitched in to serve food and help with the science activities. A bunch of hand-drawn thank you's rolled in following the event- many of them saying: "I love science!" A great time was had by all.